Laurel Wales, People’s Action Deputy Director of Movement Politics, sat down with Our Future’s Leigh Friedman to talk about the outlook for grassroots candidates in November’s general election and beyond. This is part two of a two-part interview. OF: As all eyes turn towards general elections on November 6, what are you hoping for? We had some great victories in the primaries this year, but the general election is about living in the world as it is – articulating and then pushing for something new. We fight against those who say change is not possible by proving them wrong. We pick flagship races, fight for them based on our theory of change, which sets us up for bigger, bolder wins in the 2020 election. That’s the only way forward, by showing the truth that having more and more people share their experiences, getting involved and turning out to vote can be life-changing. OF: What candidates in November are you really excited about? LW: There are so many, all across the country! I am really excited about our work supporting candidates for governor, like Paulette Jordan in Idaho, Ben Jealous in Maryland, and David Garcia in Arizona. These are candidates that we fully endorse and support, and have known for a long time. I’m also really excited about Ilhan Omar, who’s running for Keith Ellison’s old congressional seat in Minneapolis, because I think she’s on a path to victory. She’s ready to go to Congress. It’s exciting to see somebody advance who took a bold risk, two years ago, when she ran and won a state House seat. She then saw and seized an opportunity to say, “We deserve more, we deserve better for our people,” when she decided run for something even larger – and then made it through a hotly contested, six-way primary. 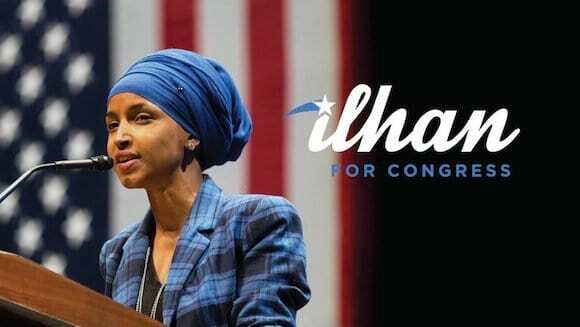 I’m excited for what Ilhan’s candidacy will do for turnout and participation in the core areas [of her district]. She’s also a longtime ally and friend of Take Action Minnesota, People’s Action’s affiliate in the state. We have some great down-ballot races, too – we have a member-leader running in Wisconsin, Jeff Smith. I met him over a year ago when he came to one of our advanced trainings for the candidate pipeline program. He’s running in a pretty red area, but has the opportunity to flip it. I also want to shout out some of our primary candidates who put up great fights in tough races, like Brandy Brooks, who ran for Montgomery County Council in Maryland. It was her first time running for office, in a 34-way race for a district that represents over a million people . She didn’t make it to the top, but she received over 26,000 votes — Brandy actually had more people show up and support her than Ocasio-Cortez did in her New York congressional race. It wasn’t enough for her to win, but I’m excited to see what she does in the future. I also think about Lashaya Dawson, who lost her primary race in the Flint, Michigan area, but really stood out as a Flint water activist, a local neighborhood leader, and a powerful community organizer. They didn’t win, but they’re ready to keep going. That’s going to be important. I’m also really excited about Stacey Abrams in Georgia and Beto O’Rourke in Texas — People’s Action doesn’t have a base in those states so they’re not races we’re working on, but those are some candidates worth watching as well. OF: What do you hope the New York Times headline says on November 7th? LW: This one is hard for me — what I really want it to be is “Community Organizing Spurs New Movement and Takes Over Halls of Power.” I want it to be deeply connected to the people we are moving into action, the stories that folks have, the way they’ve felt their own power in this election, maybe for the first time. I don’t want it to be just “Progressive Wave Wins:” I want it to have a deeper story behind it. And I don’t want the headline to credit Trump for what’s happening at the grassroots. While he’s in the forefront of people’s minds right now, a lot of this work started way before him. I think about the movements that came out of Ferguson. I think about the candidates we ran in 2015 who wanted to step up for their communities, and show they knew a better way in politics because they live the day to day life of a struggling person in this country. These candidates are really fighting for what’s possible, what this country could be about. I don’t want the headline to suggest backlash against Trump is why we won, because there’s so much more depth to it than that. OF: Take us to January. How is People’s Action going to make sure candidates you’ve helped elect are co-governing with the people? We’ll also have an orientation about what neoliberal policy looks like, how to prevent and fight back against it, and understand the pressures they’re going to face as soon as they step in. We’ve been building with a couple different groups over the course of this year to get ready for that. In December, we’re going to host our first conference for elected officials. It will be a webinar, and have newly elected folks from all across the country to get them connected to one another across levels of government. We’ll get in to the nuts and bolts of what to be ready for, and start to build platforms and policies for when they walk into their office for the first time. Then, throughout the beginning of their first terms in 2019, we’ll look to create spaces for ongoing connections in the community between elected officials and our base. A lot of the time, organizers think of elected officials as our “targets” – now we have to start seeing them as part of our base. We’re also exploring ways to build broader infrastructure and collaboration both in and outside of People’s Action. I do want to recognize that it is not and cannot be just about our group — there has been a huge wave of movement organizations finding ways to work together, paying more attention to elections and popping up to build this infrastructure. This is something the right has done well for a really long time, and we on the left just haven’t done it. The walls we have to smash down are walls of corporate money, patriarchy, and racism — those walls are huge, and one organization can’t do it alone!